Catalent says the $200 million it will spend over three years to expand drug substance manufacturing capacity and drug product fill/finish capacity in Bloomington, IN, and Madison, WI, reflects a commitment to expand further its fast-growing biologics business. Work has begun at both sites, with completion expected in mid-2021. The provider of advanced delivery technologies and development solutions for drugs, biologics, and consumer health products cited projected growth among existing and future customer in announcing the expansion this week. Biologics accounted for 26% of the $2.463 billion in total revenue Catalent reported for its 2018 fiscal year, which ended September 30—nearly double the 14% of FY 2017. Riley said the company wants to grow the percentage of its business that is biologics-driven, but won’t say how much higher it is looking to grow that business. In October 2017, Catalent signaled its intent to expand in biologics manufacturing by completing its $950 million acquisition of Cook Pharmica, gaining control of the Bloomington facility as a result. “This expansion investment and other investments like the Cook acquisition is a signal that Catalent is putting significant weight on biologics as part of a growth strategy for the company,” Riley said. Installing a high-speed flexible vial line, utilizing both ready-to-use (RTU) components and bulk filling, at a filling speed of 300 units per minute. Installing a high-speed flexible syringe/cartridge line with a filling speed of over 300 units per minute, as well as a fully automated vial inspection machine. Expanding fill/finish capacity by 79,000 square feet, with both GMP and non-GMP capabilities—adding space to the 875,000-square-foot biologics development and manufacturing facility. The Bloomington site is designed to offer Catalent clients its expertise in sterile formulation and extensive biomanufacturing and drug product fill/finish capacity across liquid and lyophilized vials, prefilled syringes, and cartridges. In December 2018, Catalent said it would invest nearly $14 million to build a 15,000-square-foot biologics packaging facility intended to expand its capabilities and capacity. Also last month, Bloomington recently achieved regulatory approval for a 20th commercial product produced there. In Madison, Catalent plans to add 100 people to its workforce of about 300 by increasing mammalian cell culture capacity. The company plans to build out two new suites—each with a 2 x 2,000 L single-use bioreactor system—providing additional clinical and commercial production capacity at the 2,000 or 4,000-L batch scale. Catalent said its Madison site will also add space, resulting in a 160,000-square-foot facility. Madison specializes in development, manufacturing, and analytical services for new biological entities and biosimilars. The facility is designed to provide flexibility in batch size to meet client needs, offering cGMP production from 10 to 4,000-L scale. 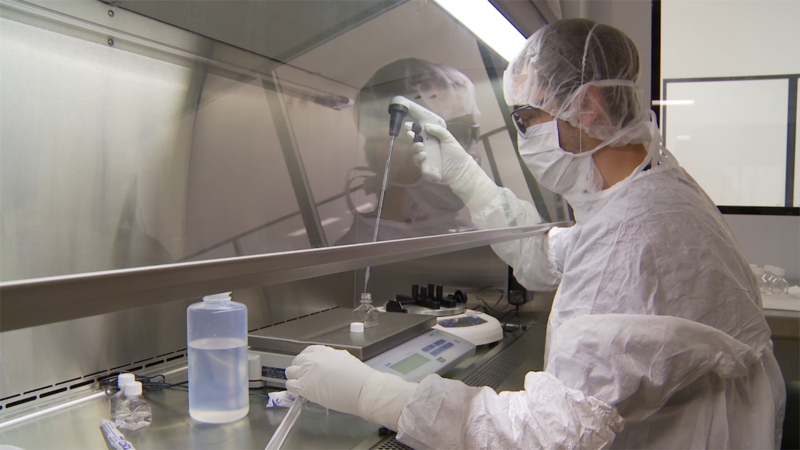 Madison is home for Catalent’s proprietary GPEx® cell line development technology, which the company uses to create high-yielding mammalian cell lines. According to the company, more than 500 different mAb and mAb fusions and over 70 different recombinant proteins have been produced using GPEx, with 50+ GPEx cell lines in clinical trials. Catalent recently celebrated the approval for commercial use of the tenth biologic therapy utilizing GPEx technology. As with the 20th product produced in Bloomington, Catalent won’t disclose the therapy or the client marketing the drug. He added that Catalent continues to invest in other technologies, such as continuous manufacturing technology at both facilities, and the Beacon® optofluidic platform of digital cell biology company Berkeley Lights deployed in Madison. Beacon’s four integrated workflows—import, culture, assay, and export—are being implemented by Catalent into its workflow for process development clonal selection under a partnership announced in July. In Emeryville, CA, Catalent has advanced the proprietary SMARTag® Technology precision protein-chemical engineering platform for developing advanced antibody-drug conjugates (ADCs)—a platform using IP from the University of California, Berkeley, and initially developed by Redwood Biosciences, which was acquired by Catalent in 2014. The first product developed through the platform was the ADC candidate TRPH-222 (CD22-4AP), a novel, site-specific ADC targeting CD22, which is expressed on nearly all B-cell malignancies. TRPH-222 was licensed by Catalent to Triphase in 2016 and has begun a Phase I trial (NCT03682796) in patients with relapsed and/or refractory B-cell lymphoma. Celgene has an option to acquire all Triphase assets relating to TRPH-222, under an agreement also signed in 2016.